Folks on here are pretty great. I vanish for a while and people express concern… It makes it feel like the past year of blogging was really worth something! Well, I basically got sick of talking about my life for a while. Homesteading can be rough and when you have losses and low production it isn’t very fun to be reminded of it constantly. Things are looking a bit better right now and so I will probably go back to writing at least semi regularly… Thanks so much for your support! Things have been generally busy here on the homestead. We lost all of the black and copper maran chicks we hatched out due to local cats. My four year anniversary with Greg came and went. 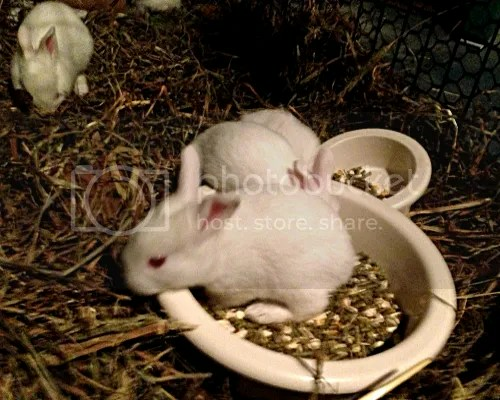 We added several new rabbits to the herd and we now boast two rabbits out of a buck from Dave Mangiones rabbitry. We are still building new cages and our PVC shelf in the garage to go with ’em. Our garage is a mess of building right now! One of our chickens (Tender, the nicer of our Golden Girls) was murdered by our killer husky, Nukka. RIP Tender. You made an awesome Coq Au Vin! Our Husky now wears a shock collar as this is the second animal dead due to her extreme prey drive and there have been far more than two attacks. While we haven’t used it yet it is there if we need it and we have plans for deliberate training sessions in the future, rigged so she associates the shocks with the animals, not us. Winter is now in full swing here. We have had a lot of snow lately and the past few months as it got colder the rabbits were just not producing. 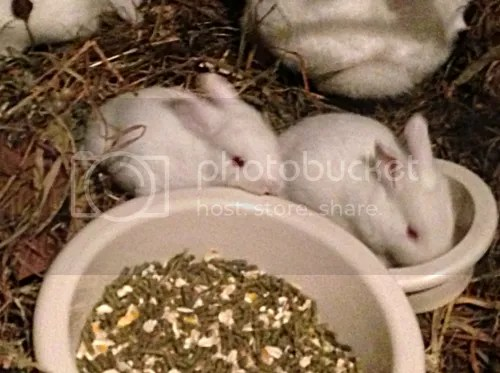 Nobody is sure what happened to give us three months of no rabbits but a week ago Kibbles and Iams popped out 20 kits for us! Yikes! 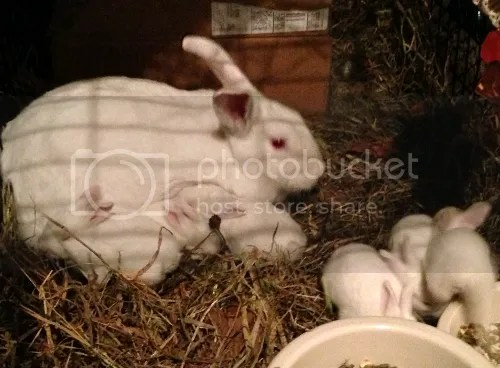 Unfortunately, we lost four rabbits from these first litters of the season. We struggled a bit with the cold last year, and I suspect we will just loose more kits in cold weather than warm. Two of the kits simply got out of the nest box and it is far too cold for them to survive without their siblings. One of the kits was a runt, and didn’t get fed enough. That kit was in a litter of 11, so I cant say I am surprised that one did not get fed. The fourth kit Iams removed from the nest deliberately. It had a large, infected looking lump on its face when I found it. I am not sure how the lump got there in the first place but Iams knew that this kit wouldn’t make it and pulled it out of the nest. This leaves 8 kits in each litter which is still substantial and they are doing great now. I am really looking forward to what the future holds for our rabbitry! Egg production for the chickens has fallen off. At this point none of the three Australorps are laying, but at least two of them molted also. Nugget is still going strong and laying an egg every couple of days… But her eggs are often coming out strangely shaped, too big, or double thick shells. This is how double yolker eggs are born, but it is also how chickens prolapse and die. Golden comets are notorious for having issues with their reproductive tracts and are twice as likely to prolapse as a heritage breed as a result. But they also lay very large eggs even through the winter. It is a trade off we make with many domestic animals; High, year-round production often means a higher mortality. This is why I only breed my rabbits once every 2-3 months and why many dairy cows die after only three pregnancies. And speaking of unreasonably productive chickens, we put the last of the Cornish Crosses in the freezer a couple weeks back. This experience has taught me that I do NOT like processing chickens. I have no problem with slaughtering the bitey monsters, nor with gutting them… But feathers are the worst, whether you skin or pluck. It takes forever and a lot of effort to do either and it left me with a large feeling of apprehension every time I had to dispatch another bird. I started thinking that their constant attempts to bite off my fingers were charming and wondering how well Cornish Crosses would lay… All because I did not want to deal with that awful skin. Eventually every one of those chickens met their fate at the end of my butchering scissors, but it was rough. Next time I am taking them to a processor and letting them deal with it. Can I butcher any chicken I need to at any time I need? Heck yeah, but I have no reason to take on that much stress and effort at this point in my life. Some day I will invest in a plucker and then I will consider butchering chickens myself again. For now the ones I did process have gone on to feed some great local people including myself and are delicious! Our gardens have gone dormant for the winter. I have some root veggies in the ground under the vauge hope they will come back in the spring… The pepper plants were potted and brought indoors and the tomato plants were ripped out and deposited in the chicken pen. The real champion of our garden was our heirloom organic Kale. This plant took the hot and the cold like a champ and are only just being ripped up as the weight of the snow is crushing them, not the cold. The mother rabbits really appreciate the huge hunks of kale they have been getting as a result! I will be planting a HUGE patch of his kale next year and making kale chips. It is very exciting! And Christmas is on us once again. Some of you may have guessed but I am not Christian. I still celebrate our modern Christmas, though, because I love the ideas behind a modern Christmas. Almost every culture has a winter fesiltival of lights to bring a bit of sunshine into the grey and cold. I love giving and getting presents and I love how many different cultures went into producing the holiday as it is today, from the Christians to the pagans with Saturnalia and the history of the tree and even the contributions of a commercial society like Santa Claus and holiday TV specials! I feel like Christmas is our modern society’s festival of lights and whether you put an Angel, a star, or a peacock on top of your tree it is beautiful to look at. I hope everyone has a happy holiday this year, and whatever you celebrate for your religion I hope you have a Merry Christmas anyhow! And don’t worry…. I am sure you will hear from me again soon! Well, I hope everyone had a great easter! I have finally gotten the rest of my seeds in dirt. My kale and arugula should be popping up any day and the peas and carrots will be a couple weeks behind. I transplanted my pepper and tomato sprouts into bigger containers. They are ordinary posts with clar plastic cups over them. These make great make-shift greenhouses and are stupid easy to put together. My pumpkin has several growing sprouts aside from a nearly foot-tall mother vine, and is spreading in it’s milk-jug greenhouse rapidly! By the end of planting season I should have dozens of plants popping up! My compost is coming along well, too. There are some mushrooms desperately trying to take hold in the topmost portion (though not doing well), but further down the pile is rich and black. I will soon be ordering $100 of soil ammendments and wood chips from a local landscaping supply company. This will let me level out the low parts of my lawn some and build my raised garden beds. I will be getting two yards of garden bed materials, and a dozen yards of wood chips. The wood chips will go in the back end of my lawn where the chicken, duck and rabbit pens are/will be. The carbon-heavy chips will mix with the nitrogen rich bird and rabbit poo and become some fantastic dirt for next year’s garden beds! And the chickens will regularly turn it and pick out bugs for me so it’ll be well-aerated and maintained! Speaking of chickens, those will be happening fairly soon! I found someone with Black Australorps for sale and this weekend I will be getting the last of my coop materials. The coop will be about 4’W X 4’L X 3’H with one or two nest boxes off the side. The coop will have a couple of windows, one BIG door that opens to allow for cleaning, and then a lid over the nest boxes that lifts easily. At least that’s the goal! For winter I will have little solar-powered LED lamps in the pen. For summer I will be buying a big peice of canvas and setting up a makeshift swamp cooler. If the chickens work out I will be moving on to ducks for next spring! Looking WAY forward to that! Greg loves ducks. For that matter, Greg likes Silkie chickens and we may end up with just one of those. In fact since the plan is to have a very small number of chickens (so we’re not FLOODED with eggs) a silkie might be good just to bulk up the flock and make the chickens feel safer. 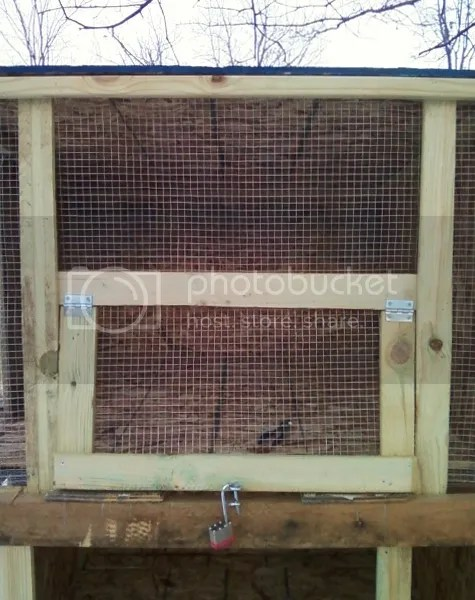 I will also be building my own chicken waterers and feeders! Hoorah! I have also been cleaning the house like crazy. Greg’s mom and siblings will be in town this weekend! The house needs to not only look nice but all my homesteading stuff (normally spread all over the place) needs to be put away and the animal cages tidied up. Greg’s familly is from New York, NY. Having a pile of fur in one corner, a canner in another and rabbit poo in a third will just not be acceptable! So after this week our house will be spotless! Whew! 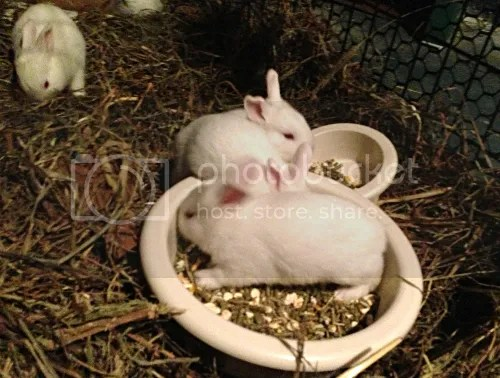 They will be very excited to meet the baby rabbits though, and the babies already have fur on them! 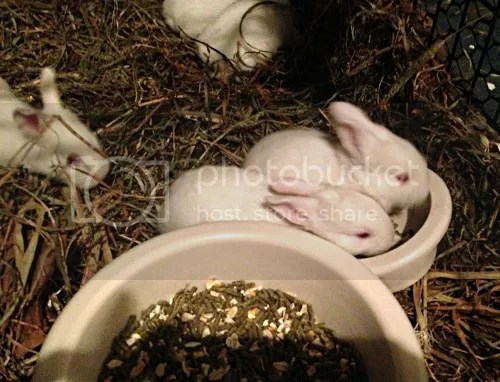 They are also the most active baby rabbits I have ever met. They are constantly squeaking, wriggling and when I check on them they start flipping out of the nest box! This week is supposed to get warmer, sustained warmer. Is pring finally here? I sure hope so! Well, it’s been a rather uneventful week on the homestead. After the rush of rabbit processing, things slowed down immensely for a brief while. Daily tasks were accomplished and we took some time to sleep and recover. My mother, who has been in the hospital for a month, is now home but requires at-home assistance which has been the main focus of the past week. With my father home over the weekend, I got to stay home but I will be back attending to her come tomorrow. She has a large open wound and is very unsteady on her feet after being in a bed for a month but she is recovering. We’ve had some sunny days this week and all four rabbits got some time outside in the sunshine on a finally (relatively) dry lawn. We had some fresh grass so I decided to just let them go to town. 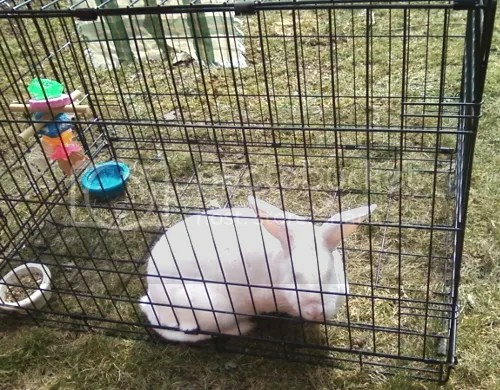 I simply took my “spare cage” as a rabbit tractor (which is one of my not-so-spare dog crates with no tray and a rabbit toy in it) outside, put a cloth up for shade and a bowl of water in it. They were quite pleased over it! But we found out that Kibbles has some serious allergies of some sort. Inside the garage she couldn’t care less, but outside she started sneezing a lot. I brought her back in and the sneezing stopped. I hope this is temporary. I would like to move her outside permanently after she has her litter. You can’t tell but it was super sunny in this shot and I could hardly see my screen so all the shots came out at akward angles. I also cleaned up around the rabbit hutch. I dragged a rake out and raked up all the hay, wood, carboard and feed that had spilt on the ground. Between that, cleaning up the garage a bit and cleaning out Purina’s cage the compost pile re-filled quickly and will now take a week or so to mellow down again. Every time I add new compost it is huge and in a few weeks it’s half the size. Still, I’ll be adding even more to it soon when I change the other three cages of bedding. 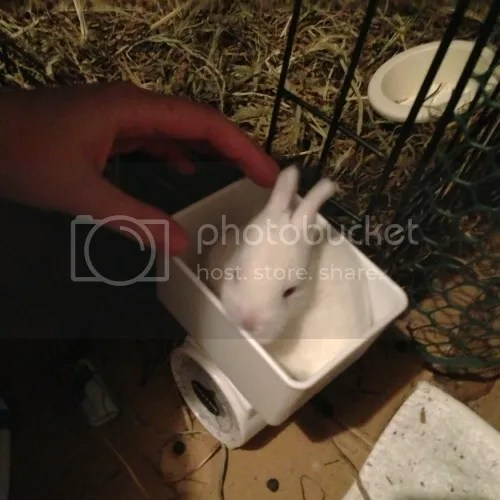 I still haven’t gotten aorund to cleaning up Tasty’s old cage for kibbles to move in… Because kibbles has a potential 2-3 months indoors still! I tidied up the lawn a lot in general as well, stacking some branches and raking out garden beds. My wild garlic is trying to sprout as well. My peppers in my seed starters finally sprouted too! I got myself 6 sheets of 1/4inch plywood for my chicken and duck coops as well. The plywood sheets had to be cut in half to fit in the car and we had to work at it but it happened. They were being sold for $7/sheet, when at a box store they tend to go for $24/sheet. I am quite pleased to have saved $100 this way. I may also be getting a huge load of wood chips from a tree service company that I can fill in the low points in my lawn with for free. If I just fill all the gaps everywhere with wood chips they will decompose slowly and become great fetile ground. Bugs love wood chips and chickens love bugs, so the birds will be happy living on the wood chips and the carbon in the wood chips will react with the nitrogen in the chicken poo causing a glorious scent-absorbing composting bed right where the birds live. It’s like a deep litter method of bedding in a chicken coop… But outdoors! 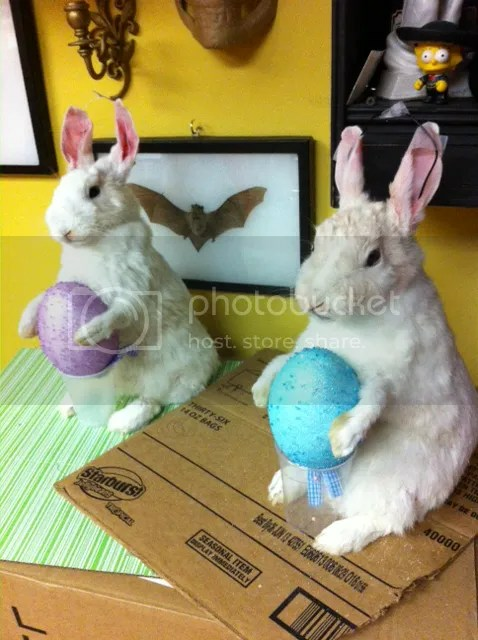 The taxidermist that took Red and Orange sent me a photo of her work. I’m not sure it’s very respectful, but I don’t feel like these particular baby rabbits were very dignified anyhow… So maybe it’s appropriate. And lastly, Evo is due this week. This will be her second chance to try to have a good litter. Last time she did not cover her babies well and they froze. She seems to be accepting the nest box but this may still not go well as right before she’s due to give birth she has a massive temperature drop and has recently been seen to be trying to nest… Directly in front of the nest box. 😛 Here’s hoping she’ll actually use it! Either way we’re going to be monitering her VERY closely. Okay, that’s a lie. I’m not ACTUALLY finished, but work on the hutch is sincerely about 1-2 days away from being complete. In fact it is so close that we have one of the cages completely buttoned down and secure. And not a moment too soon since Evo got out of her cage today once again. We put the door frames up on monday and set about affixing the wire mesh yesterday. I really wanted to put the mesh up pre-door-frames but Chuck insisted this was better. Turns out that the only way to affix the mesh to the walls this way is to crawl into the cages. I weigh too much for this and am too large to fit my fat hips through the door frames, but luckily Greg is significantly lighter and slimmer. 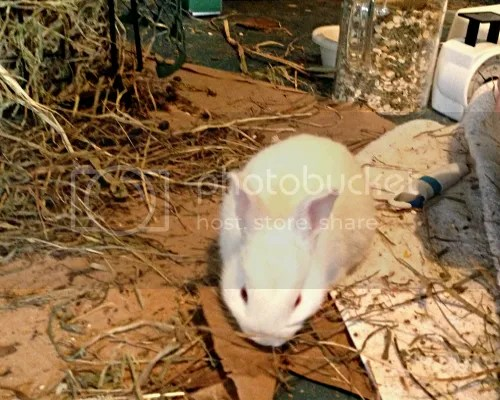 He generously crawled into each hutch to staple the wires in place along the door frames and walls. 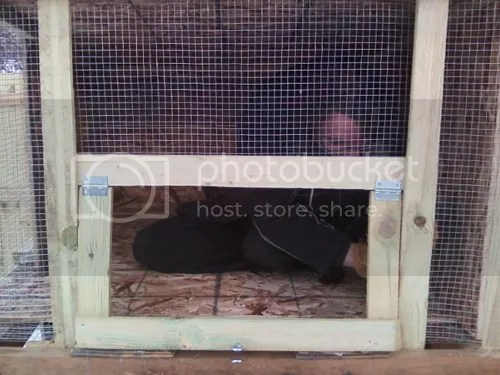 The fact that a grown man can fit into an individual unit of this cage should give you an idea of how spacious they really are. And the fact that each unit can hold well over 100lbs says that my construction is very sturdy. Greg is completely inside this cage stapling the wire down. We finished one whole cage and the second one only needs it’s wire for the door stapled in place. But because of Evo’s most recent breakout we decided the priority was moving her outside where she will be safer. We brought out a pile of used hay and fur from Tasty’s old nest and dropped it around the hutch for the dogs to examine yesterday. And today we brought out huge handfulls of hay and thoroughly covered the bottom of the cage floor. While the breeze is still chilly we’re getting another warm-front through this week so there should be no serious issues with the transition to outdoors. It is the week after that brings up concerns as it will be dropping possibly as low as 10 degrees. Still, with extra hay and their shelter boxes the bunnies should be toasty warm. 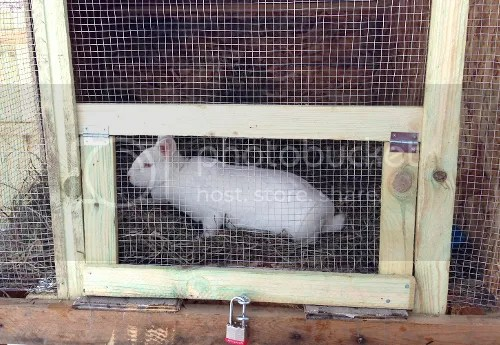 The hutch is well-ventillated to prevent the buildup of moisture which is the real problem for bunnies. In a dry environment with bedding and shelter they can easily withstand lower temperatures than we ever get up here. Evo looking around her new home. Also the cages have a little design quirk in them that I built-in. The cages don’t have a built-in latch. Instead each cage has a pair of eyelets (one on the door and one on the frame) that a padlock slides through. The ONLY way to shut the door is to lock it with a padlock. This is not exactly required but I really wanted to make sure that my cages were always locked. You can see that the only way this will stay shut is VIA the padlock on it. Today we finish the door on the second cage and start wrapping the wire on the third. And tomorrow we move Nutro outside and Purina and her litter into the empty grow-crate. Eventually all four rabbits will be outside but for now this is a good way to transition them. Moving Purina is especially important as the baby bunnies have grown quite active. Momma is eating over 1lb of food a day at this point as her babies are almost 10oz each and STILL nursing. I was 9oz when this picture was taken. At this point the babies are trying to explore and have been slipping out the wide bars of what was supposed to be a VERY temporary location. 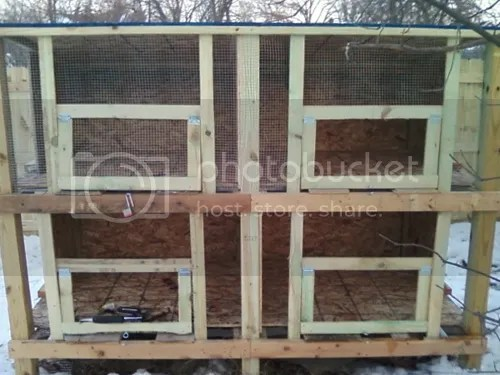 If we can get them into the grow-crate they will have deer netting stretched across solid bars for walls and will have both more space and less escaping! luckily for Purina her babies are starting to eat solid foods. They won’t be close to weaning for another week or so yet (in the wild rabbits are typically weaned at 4 weeks) but right now they’re trying out their new teeth. They have been seen to consume some of the hay and mouth on the pellets a bit. I also have some oats mixed into mom’s food that will entice them to eat it. And some have even been trying the water bottle. At this point I can’t even tell the runt apart from the rest because they are all healthy and active. Hoorah!